The Intergovernmental Panel on Climate Change (IPCC) on April 12 approved the Summary for Policymakers of the Working Group III contribution to the Fifth Assessment Report. Working Group III assesses all relevant options for mitigating climate change through limiting or preventing greenhouse gas emissions and enhancing activities that remove them from the atmosphere. The Urban Morphology and Complex Systems Institute has contributed to IPCC Working Group III, Chapter 12, entitled “Human Settlements, Infrastructure and Spatial Planning”. The contribution of the Institute to this Chapter has been focusing on the link between urban forms, infrastructure stocks, energy and GHG emission patterns. Across multiple dimensions, the scale and speed of urbanization is unprecedented: more than half of the world population live in urban areas and each week the global urban population increases by 1.3 million. Today there are nearly 1,000 urban agglomerations with populations of 500,000 or greater; by 2050, the global urban population is expected to increase by between 2.5 to 3 billion, corresponding to 64% to 69% of the world population. Expansion of urban areas is on average twice as fast as urban population growth, and the expected increase in urban land cover in the first three decades of the 21st century will be greater than the cumulative urban expansion in all of human history. Urbanization is taking place at lower levels of economic development and the majority of future urban population growth will take place in small‐ to medium‐sized urban areas in developing countries. Expansion of urban areas is on average twice as fast as urban population growth, and the expected increase in urban land cover during the first three decades of the 21st century will be greater than the cumulative urban expansion in all of human history. The long life of infrastructure and the built environment, make them particularly prone to lock‐in of energy and emissions pathways, lifestyles and consumption patterns that are difficult to change. 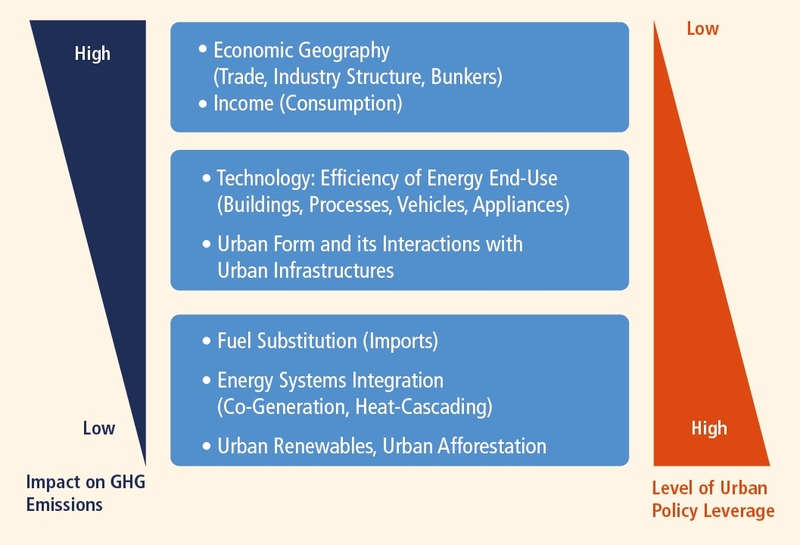 Key urban form drivers of energy and GHG emissions are density, land use mix, connectivity, and accessibility. These factors are interrelated and interdependent. Pursuing one of them in isolation is insufficient for lower emissions. Connectivity and accessibility are tightly related: highly connected places are accessible. While individual measures of urban form have relatively small effects on vehicle miles travelled, they become more effective when combined. There is consistent evidence that co‐locating higher residential densities with higher employment densities, coupled with significant public transit improvements, higher land use mixes, and other supportive demand management measures can lead to greater emissions savings in the long run. Highly accessible communities are typically characterized by low daily commuting distances and travel times, enabled by multiple modes of transportation. Successful implementation of mitigation strategies at local scales requires that there be in place the institutional capacity and political will to align the right policy instruments to specific spatial planning strategies. Integrated land‐use and transportation planning provides the opportunity to envision and articulate future settlement patterns, backed by zoning ordinances, subdivision regulations, and capital improvements programmes to implement the vision. While smaller scale spatial planning may not have the energy conservation or emissions reduction benefits of larger scale ones, development tends to occur parcel by parcel and urbanized areas are ultimately the products of thousands of individual site‐level development and design decisions. 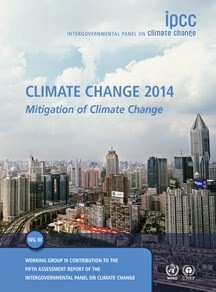 Successful implementation of urban climate change mitigation strategies can provide co‐benefits. Co‐benefits of local climate change mitigation can include public savings, air quality and associated health benefits, and productivity increases in urban centres, providing additional motivation for undertaking mitigation activities.